GREENSBORO, N.C., USA, July 19, 2018 – Syngenta kicked off its 2018 trial event series in Naples, Florida, highlighting advancements in vegetable breeding to customers from across the Southeast. These trials illustrate the company’s continued commitment to be a leader in vegetable seed research and development. In Naples, seed resellers and growers had the opportunity to see, touch and taste new and experimental varieties and hear about the benefits these introductions will bring to the market. The Naples event is the first in a series over the course of the summer. Additional events will take place in Woodland and Gilroy, California; Plainfield, Wisconsin; Pasco, Washington; Hall, New York; and Stanton, Minnesota. The following summary provides a snapshot of standout varieties and innovative solutions featured at the Naples event. Attendees at future events will experience some of these varieties, as well as others specifically tailored to meet local production challenges and market needs. Two new bean varieties, Outlaw and Desperado, showed great seed quality and early maturity at the Naples station. Desperado matures three days early, helping growers get to market sooner. Outlaw features a straight bean with great holding and low risk of lodging. Athena has been available for 25 years and sets the industry standard for eastern shipper varieties. Accolade is an evolution of Athena’s heritage to meet specific needs in the market. Another eastern shipper variety, Astound, also provides growers with great internal fruit quality and flesh firmness for extended shelf life. Grandprize squash and Everglade zucchini were new introductions featured in the trial. A direct upgrade from Envy, Everglade produces higher yields and offers improved flavor for consumers. “Grandprize directly addresses the needs we’ve heard from growers in the field,” said Stoddard. Several sweet corn varieties were featured at the Naples trial event, including Attribute® II offerings with tolerance to glyphosate and glufosinate herbicides for greater flexibility in weed management. Attendees were able to see a number of tomato varieties that offer flexibility for multiple planting slots, including a new, mature green variety Varsity. Varsity is well-suited for the Florida and Georgia markets with strong disease resistance to TYLCV, TSWV and Fusarium crown rot. This resistance stack is coupled with strong yield performance to help increase potential return on investment. To broaden its strong portfolio, Syngenta is also breeding new varieties for the hot-set market. "We’re excited to be re-entering the hot-set market and are actively trialing varieties with TYLCV resistance coupled with hot-setting ability,” Broadbent said. Some of our newest experimental varieties shown at the trial featured Fusarium race 2 tolerance plus stronger vines for full season harvesting versatility. Varieties currently available, including Melody and Excursion, also performed well under high-stress conditions at the Naples station. 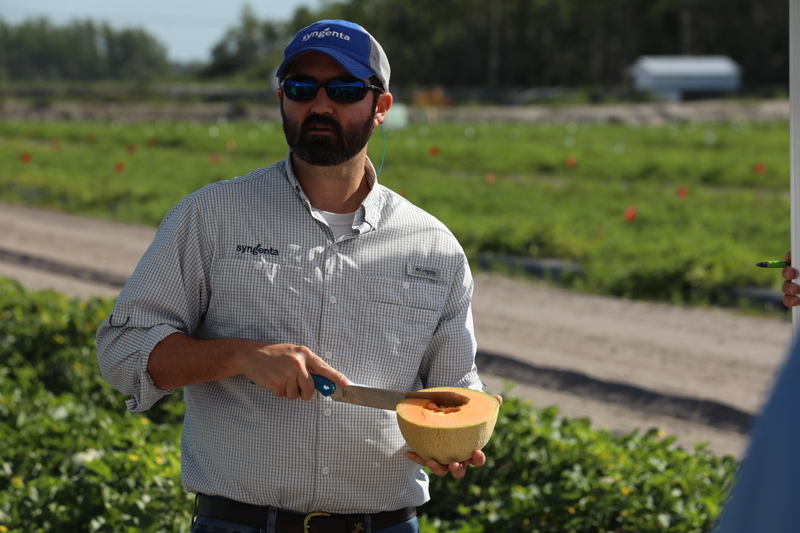 “We were happy to see good performance in the field, and think the best is yet to come for our watermelon program,” said Jose Cabrera, product manager, watermelon, at Syngenta. Cautionary Statement Regarding Forward-Looking Statements This document contains forward-looking statements, which can be identified by terminology such as ‘expect’, ‘would’, ‘will’, ‘potential’, ‘plans’, ‘prospects’, ‘estimated’, ‘aiming’, ‘on track’ and similar expressions. Such statements may be subject to risks and uncertainties that could cause the actual results to differ materially from these statements. For Syngenta, such risks and uncertainties include risks relating to legal proceedings, regulatory approvals, new product development, increasing competition, customer credit risk, general economic and market conditions, compliance and remediation, intellectual property rights, implementation of organizational changes, impairment of intangible assets, consumer perceptions of genetically modified crops and organisms or crop protection chemicals, climatic variations, fluctuations in exchange rates and/or commodity prices, single source supply arrangements, political uncertainty, natural disasters, and breaches of data security or other disruptions of information technology. Syngenta assumes no obligation to update forward-looking statements to reflect actual results, changed assumptions or other factors. ©2018 Syngenta, 410 Swing Road, Greensboro, NC 27409. Important: Always read and follow label instructions. Some products may not be registered for sale or use in all states or counties. Please check with your local extension service to ensure registration status. Seed products with the LibertyLink (LL) trait are resistant to the herbicide glufosinate ammonium, an alternative to glyphosate in corn, and combine high-yielding genetics with the powerful, non-selective, postemergent weed control of Liberty herbicide for optimum yield and excellent weed control. LibertyLink®, Liberty® and the Water Droplet logo are registered trademarks of Bayer. Attribute® and the Syngenta logo are registered trademarks of a Syngenta Group Company.